More on this guy over at Tet Zoo and Theropoda. I'm still geeking that it had quill knobs and that hump! Awesomeness! Interesting artwork and a very credible interpretation, however, the jury is still out on whether Concavenator corcovatus is evidence of a feathered member of the Allosauroidea and whether the common ancestor of the Allosauroidea and the Coelurosauria was feathered. This could be an example of convergent evolution. Well it sort of depends on several factors, but this isn't a case of convergent evolution, it merely points to an earlier appearance of feathers in the theropod line. The feathered Tianyulong sort of points to feathers evolving at the very base of the dinosaur line. Hey Brett! Thanks to drawn a dinosaur from my country:) New theory of Carcharodontosaurids having feathers with this dinosaur? This newest find has possible quill knobs on it. Scales don't do that but I guess it's possible. But feathers on the arms are also possible. Thus all the feathers since this wasn't a huge animal. I drew this the night before the paper was published off the abstract and a photo from Theropoda. Indeed, the "quill knobs" are in the wrong place and irregularily positioned along the bone. Darren Naish and Mickey Mortimer have suggested they represent ossified points of contact for muscle sheets. Hi! I'm one of your biggest fans! *_* My goal in life is to become a paleontologist, so it's HIGHLY relieving to FINALLY find someone who is willing to talk about evolution and also agrees that many theropods had feathers (or at least protofeathers)! 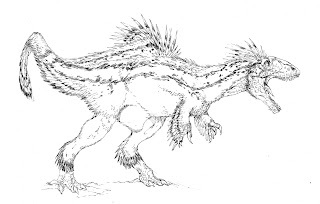 I have heard about Concavenator, I do find it VERY interesting that it had the quill knobs :) I especially like what you did here with the feathers on the hump. It reminds me of what I like to do with my dromaeosaurids; I tend to put a huge clump of large, upwards-pointing, feathers on the spine between the hips. Art Evolved Pop Culture Gallery!